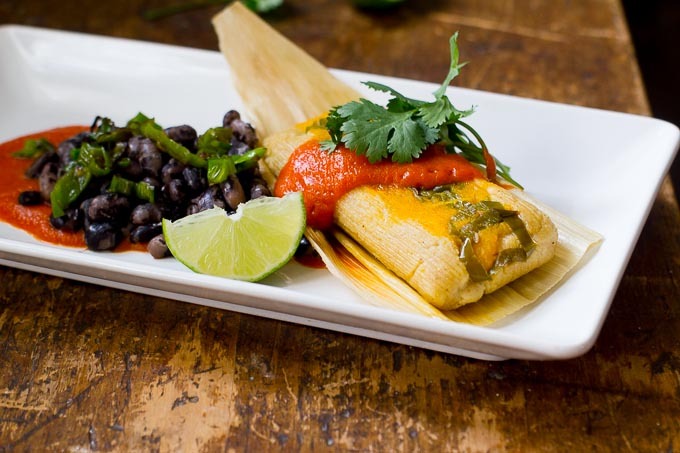 Tamales are usually only made on special occasions, but with a little practice, you’ll want to make them more! 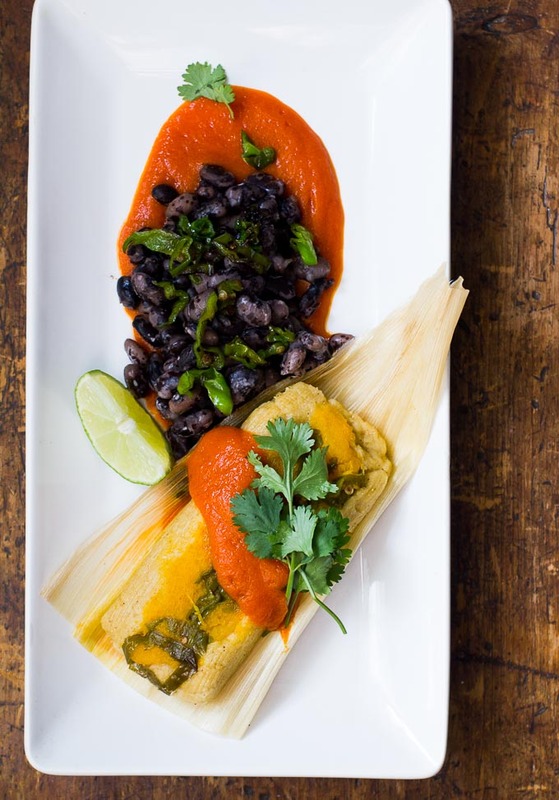 This pumpkin tamale is a great option for a harvest dinner or holiday entree. It’s actually a great idea to make a large batch and freeze them! They defrost and reheat easily and a very portable as well. You can also change up the stuffings with almost any vegetable. I love mushroom tamales too! The sauce is fat free (unlike the tamales!) and is great on pasta or even eaten as a soup! Roast the pumpkin whole for 1 hour or until easily pierced with a knife. Remove and cut in half. Scoop out the seeds and allow to cool. With a spoon, scoop out the flesh and place in a mixing bowl. Mash and season with salt and pepper to taste. Place the whole bell peppers on a baking sheet and roast whole for 20-30 minutes or until the skins have started to blacken and bubble. Remove from the oven and allow to cool. Once cool, peel off the charred skins and remove the stem and seeds. Place the bell peppers and ½ the mashed pumpkin in a blender and add a few tablespoons of water. Blend until smooth, adding more water as needed. Season with the smoked paprika, salt and pepper (to taste). Saute the sliced shishito peppers until soft and slightly blackened. Set aside. In a large bowl, add enough warm water to cover half of the package of dried corn husks and allow to soak for about 30 minutes. Drain and set aside when ready to use. In a mixing bowl, add the masa harina, sea salt, cumin, baking powder and chili powder. Mix together separately the olive oil and veg stock or water. Add the liquids to the dry mixture. Mix into a dough. Turn the dough out onto a counter or flat surface. Knead the dough well for about 15 minutes. Allow to sit covered with plastic wrap for about 30 minutes. Get together a large stock pot and metal vegetable steamer or colander that fits in side the stock pot. Add 2" of water to the stock pot and bring to a boil. Turn down the heat and allow to simmer covered. Take 2 of the soaked corn husks and lay them flat, wide ends overlapping. Scoop about 2 Tablespoons of the masa dough onto the corn husks and spread to about ¼" thickness, about 2" wide and 4" long. Down the center of the flattened masa dough, add 1 Tablespoon of mashed pumpkin and a few pieces of shishito pepper. Using the husk, fold the sides of the masa dough towards the center lengthwise. Fold the tamal up well in the husk and place folded sides down in the stock pot with the boiling water onto the steamer or metal strainer. Make sure the tamales are above the water! Finish wrapping all the tamale dough in the same manner and place all the wrapped tamales into the steamer set-up. Steam covered for 1 hour. When they are thoroughly cooked they should have a little "bounce" when you poke them. Serve immediately with the pumpkin/pepper sauce. Serve with black beans, cilantro and lime. The tamales can be re-heated in a microwave oven for 2 minutes in the husk. They can also be pan seared or reheated in the oven on 350 F out of the husks. The husks can be used for presentation purposes, but are not meant to be eaten.